The first annual Van Go Art Fair is set for 10 a.m. to 5 p.m. Saturday, March 30, in Van City Park in Van, Texas, on the 166th birthday of Vincent Van Gogh. The event features a full day of juried art, performing singer-songwriters, wineries, food trucks, a young artists exhibition, and a kids’ art area. The main attraction is the juried art show with 25-plus artists presenting a variety of mediums including oil paintings, metal sculpture, pottery, jewelry, photography, fiber, glass, and leather. Artist Randy Martin was a successful creator of one-of-a-kind birdhouses until he saw the movie Twister and found a new love in the ways of kinetic art. He likes art that moves, and works with copper, steel, and other materials to create exquisite sculptures for both indoors and out. Martin is doing live demonstrations creating copper daylily bird feeders throughout the day. Kerian Massey is a graphic artist and illustrator by trade, but puts brush to canvas whenever an idea sparks in her mind. 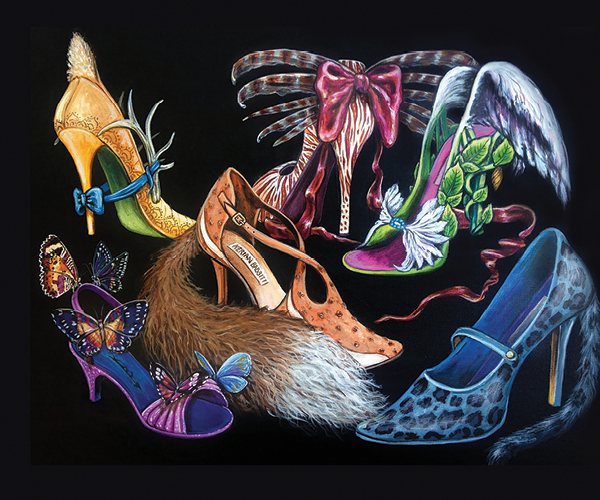 Her work is on the “quirky” side covering animals, cars, chairs, shoes, people and funky ideas. Her take on the normal gets bent by her love of surrealism and imagery, bringing the viewer on a small visual adventure. Inspired by nature and mechanical things, Jessica Lisby creates intricate jewelry with the concept of taking something broken or unloved and giving it new life. Frankie Davis is bringing her “tinker illustrations” to the fair. She blends mixed media, illustration, decoupage, simple mechanics, and paper engineering to create textured, 3D, and often interactive pieces. Bringing his handcrafted native hardwood three-legged stools is Randall Ricketts, and Don and Lori Dudley of Dirt on Your Skirt show their animated character ceramics and pottery. Other artists include Cindy Fuqua, horse hair pottery; Kathy Kromer, Matisse-like creations with paper, texture, and vibrant colors; Sylvia Morse, small metals and ceramics; Monica Lubiani, colorful glass art jewelry and housewares; and many others. Also located within the art show is a Young Artists Exhibition with art teacher-selected pieces from Van ISD junior high and high school students as well as recent graduates. The music line up for the day includes talented singer-songwriters Elfin Paige, Zack Pohl, Josh Wallace, Andie Kay Joyner, Chris Rasco, Meredith Crawford, Lucas Kelm, and Heather Little. Valle della Pace Vineyards & Winery and Green Goat Winery bring their locally made wines. Food trucks offer a wide variety including German fusion meat buns, rice bowls, papaya pickles, as well as burgers and fries, and plenty for the kids. Sweets include handcrafted gourmet ice creams, sorbets, cheesecakes, and other fresh-baked pastries and cakes. Not to be missed are works-of-art chocolates by Kaitlin’s Confections. The Kids’ Art section has several hands-on projects for kids of all ages as well as a face painter creating Van Gogh-like art on little faces. Other activities during the day include art selfie backdrops, a Toast to Vincent, and a Van Go Costume Contest. Guests of all ages are invited to come dressed as famous paintings like self portraits of Vincent Van Gogh and Frida Kahlo or Leonardo da Vinci’s “Mona Lisa.” Voting takes place throughout the day on site and on social media for best costume and winner receives $200 cash plus event merchandise and artists’ contributions. 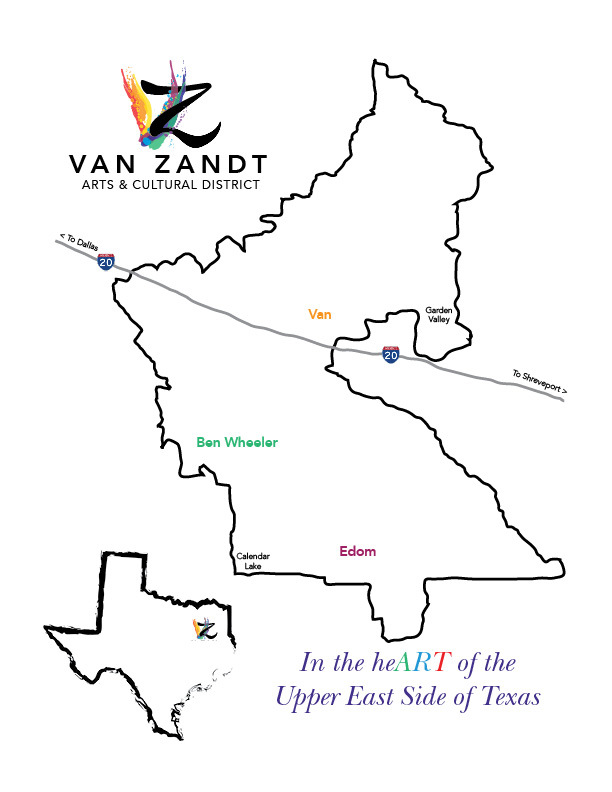 The Van Go Art Fair is produced and sponsored by the Van Zandt Arts & Cultural District Foundation, City of Van, Moore’s Store, and other area businesses and individuals. Proceeds benefit the foundation to support arts education and tourism for the district that includes Van schools and the towns of Edom, Van, and Ben Wheeler. For more information, visit vangoartfair.com or call (903) 952-7075.